This delicious ricotta veggie spread is one of those recipes that sometimes just “happens” when you stare at the contents of your fridge and wonder what to do with ingredients you have on hand. Do you ever do that? Just start thinking of things you have in your fridge or pantry and how you could put them together to make something delicious? Maybe that’s just me. But it’s how I’ve come up with some of the recipes we’ve enjoyed the most. I wanted to put together a little something to snack on for the afternoon and what I came up with was this spread. It’s quite light and the combination of veggies with the basil and touch of garlic was really delicious. I’d easily serve this as a nibble along with cocktails or just as an afternoon snack. Try this one and let me know what you think! All you do is mix all your ingredients together in a small bowl. Cover the bowl and let it sit in the fridge for a while so that the flavors blend really well. Serve the spread with an assortment of crackers. This ricotta and fresh veggie combination is a great hors d'oeuvres served with cocktails or just as an afternoon snack. Combine all ingredients in a small bowl. Mix well. Cover and refrigerate for several hours to allow the flavors to blend. Serve with an assortment of crackers. Great timing – I was just noticing I had some ricotta in the fridge that I didn’t have a use for. Now I do!! Thank you! Glad I could help you with that ricotta, Valerie! 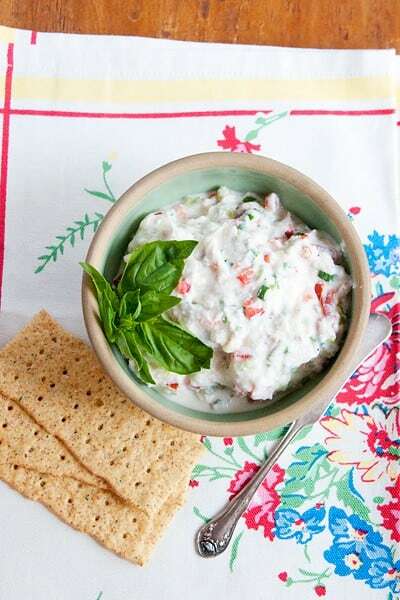 I absolutely love when recipes come together like that and this ricotta spread is definitely a winner – yum!!! This is perfect for summer get togethers – can’t wait to make it! Thanks, Nancy. It was one of those things I just threw together and was like, “wow, that turned out better than I thought!” It would be just as good with cream cheese or mascarpone instead of ricotta. This looks perfect for Masters Weekend. It is a revered event here also…. I stare into my fridge and pantry all the time trying to be creative with what I have on hand. This looks delicious Lana. Nicely done and a perfect snack for munching. Thanks for including my Blue Cheese Spread in your round-up! This Ricotta spread looks fabulous! And, ricotta is one of my favs! Thanks again!